The Cosy Hen Company was established in 2008 by Peter and Glenda Stoneman as a diversification project from our alpaca breeding business, Amazing Alpacas. We were aware that alpacas protect sheep and poultry from foxes and other predators, but we had never put this to the test. We thought we should put that right so we bought a few point of lay birds, closely followed by a larger group of chickens from the Battery Hen Welfare Trust and then a number of pure blood breeding groups. From the original flock of 6, we now have well over 150 birds on the farm. We have a small laying flock, which we originally stocked with ex-battery hens. These days we stock the laying flock with modern hybrids, which are also available for sale as point of lay pullets for customers who want good egg producers. You really can't beat the taste of farm fresh eggs! We keep more than a dozen traditional and rare breeds on the farm, so have birds to suit most preferences. Our pure breed birds are so popular, that we usually hatch them to order for customers, but we sometimes have a few spare birds available when the hatch rates have been strong, so it's always worth contacting us to see what's in stock. 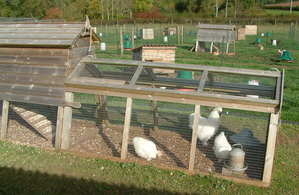 We are registered with DEFRA as poultry keepers and are members of The Poultry Club of Great Britain. Our birds live outdoors on grass in biosecure runs, with plenty of space to express themselves naturally. We keep our breeding groups in separate pens to safeguard the blood-lines and the cockerels over-winter in individual pens to rest the hens. 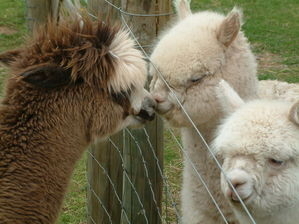 To protect our poultry from predators, such as foxes, we use electric fencing, metal mesh panels and, of course, alpacas. All our houses are securely locked each night. 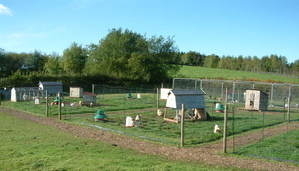 In total, we have more than 30 poultry pens on the farm. While we were looking at suitable housing we quickly discovered that some units were not particularly well-built and we agreed that we could build better ourselves. So we did.... Not only did we build houses and runs we liked; but our visitors that saw them commented very favourably too. From the first models for our own use, we designed a range of houses and runs for sale to people who wanted a quality, attractive and practical product for their birds. The Cosy Hen Company was hatched! That was all several years ago and today we have an established flock, with some nice quality breeding groups that produce strong, healthy chicks. All our birds live either in timber houses built by us, or carefully selected plastic houses, modified to suit our needs. Visitors to the farm can see the houses being used as intended and make their own judgement about their design and quality. If you are considering buying some chickens or poultry housing, do come and see what we have on our farm - we think you'll be glad you did!